Wine Friends is a registered association in Southern Finland for people who are dedicated to qualified wines and food! Their monthly meeting started the year 2014 and took place in Sofia within Orthodox Cultural Center in Helsinki. The idea for the meeting was to broaden the concept of wine world. ”Welcome to sophisticate yourself”, put Metropolitan Ambrosius his idea into words when welcoming the participants to Sofia. Sofia is a place for people to meet and slow down. Metropolitan Ambrosius, bishop of Orthodox Church in Helsinki, Capitol area of Finland, is broad minded and erudite person with humanity and culture. Metropolitan wanted his guests to have a broader context to wines, so he asked them to follow and join evening prayer in the chapel before official meeting. After the tranquil and spiritual moment Ambrosius briefly told about the icons on sight and background of Sofia. 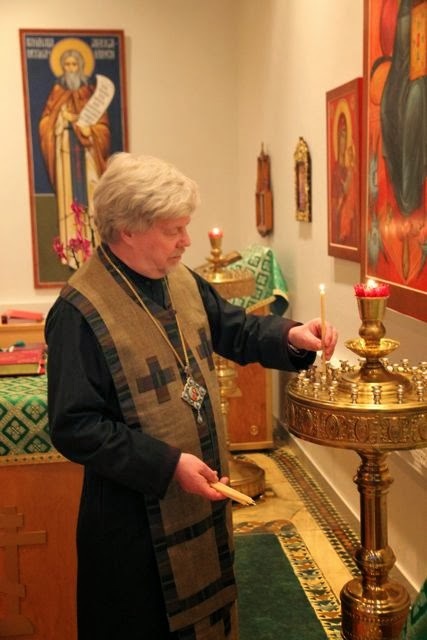 Metropolitan Ambrosius torched both candles and participants to a unique and multicultural meeting where culture, people and wines were together. One could quess that members of Wine Friends have tasted and seen every possible wines in the world. So the lecturer, wineman Heikki Remes, put just four glasses of wines, covered with foil, in front of the people and asked about the background, the country where the wines comes from? The idea was to learn about the stream of consciousness when analyzing the wines. Héritage. Luxemburg. Crémant de Luxembourg. Riesling, Pinot Blanc, Auxerrois. Pale yellow, fine and mild bubbles, citrus, peach and gentle brioche aromas on the nose, elegant crémant. PR 3Barricas. Spain, Rueda, Prado Rey 2008. Oaked Verdejo. Bright greenish yellow, tropical and toasted notes, intense, complex, well balanced and long taste. Agathon Limnio Cabernet Sauvignon. Creece. Athos 2007. Dark red, berry aromas and medium bodied, cranberry, well balanced tannins and leather on the nose. Escarche. Spain, Murcia, Jumilla, Hacienda del Carche 2012. Alc. 15%. Monastrell. Salmon red color, intense on the nose and sweet (100g/l), fullbodied, slightly orange and long taste. After the official meeting Metropolitan Ambrosius invited all to his residence for open conversation, where assortment of cheese from Acrtic Milk from Kiuruvesi and a variety of different wines were on the table. Blanca Cusine Cava Pares Balta. Spain, Penedes 2009. Chardonnay, Pinot Noir. Golden yellow, complex, subtle aroma with hazelnuts, honey and extra dry (2 g/l), round, fruity taste. Steingarten Riesling. Australia, Barossa Eden Valley, Jacob’s Creek 2012. Pale green straw, floral aromas of gardenia, citrus, jasmine and dry, balanced, intense, mineral and elegant taste. Clarendelle Blanc. France, Bordeaux 2012. Semillon, SB, Muscadelle. 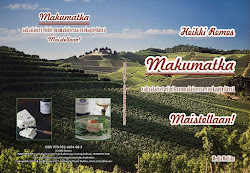 Pale yellow, lemon and floral aromas, dry (2g/l), fresh, wellbalanced and mineral taste. Gratavinum 2πr. Spain, Priorat, Pares Balta 2008. Carnatxa, Carinena, Cabernet Sauvignon, Syrah. Dark red, fruity black berry aromas, very intense, elegant, fruit and mineral, strong and long taste. Casa Cisca. Spain, Murcia, Yecla, Bodegas Castano 2011. Monastrell. Cherry red, complex, intense nose of red fruit and full-bodied, meaty, mature fruits, persistent, vanilla on the palate. Lacrima Christi. Spain, Murcia, Jumilla, Bodegas San Isidro. Monastrell. Red tile and brown tones, intense, raisy aromas and sweet(115 g/l), elegant, oaky, dried fruits and long aftertaste. La Trappe Dubbel. Holland, Bierbrouwerij de Koningshoeven. Dark brown, herbal, malty on the nose and fullbodied, chocolate aromas on the palate. Egg, festive cheddar, rose and Aurora Borealis (blue) cheese with home made greencurrantjam. 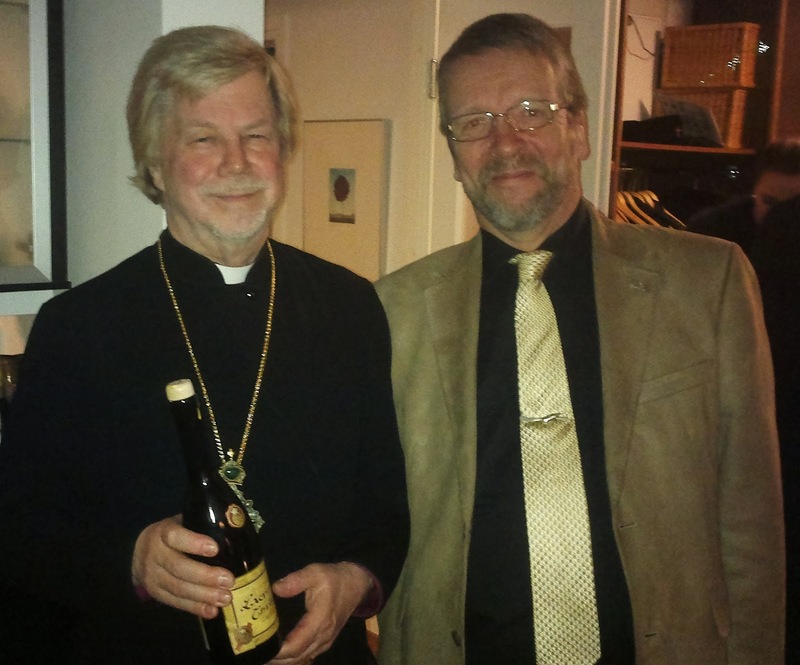 Metropolitan Ambrosius and chairman Jukka Sinivirta with Lacrima Christi wine.